My clever Mum once made me a beautiful embroidered tree with dozens of creatures painstakingly sewn on each branch. I’ve had it in a frame for years and my daughters still love looking and talking about all the different animals. It’s simple things like this that last and they mean more with time. That’s what I love about these beautiful quilts – great as a soft cover for baby’s cot but as your child grows they can learn a bit about the world outside. 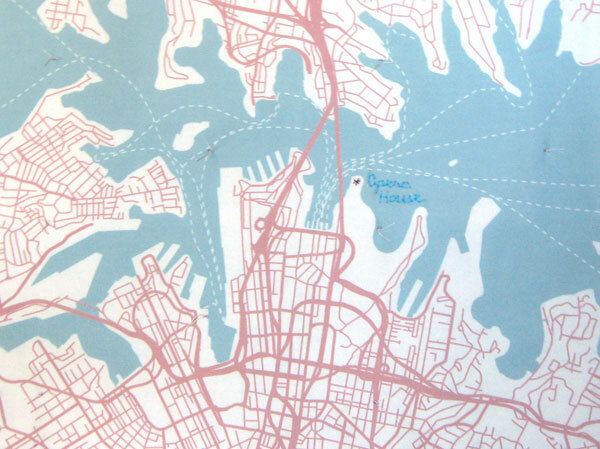 Haptic’s soft-maps are a range of quilted maps of cities and neighbourhoods. You can choose from twenty different international cities, including Sydney (image below) or Melbourne, machined and hand-stitched on machine washable cotton. Such a great idea, Haptic designer Emily Fischer says these are works of art made to last – they’re durable and can be used as blankets or picnic rugs. The quilts come in different sizes – from cot right up to full size. You can even commission and personalise your own quilt – maybe the suburb where you grew up or the country you were born in. These are great for a newborn gift or maybe a special birthday or even wedding gift. You can create your own touchable environment. 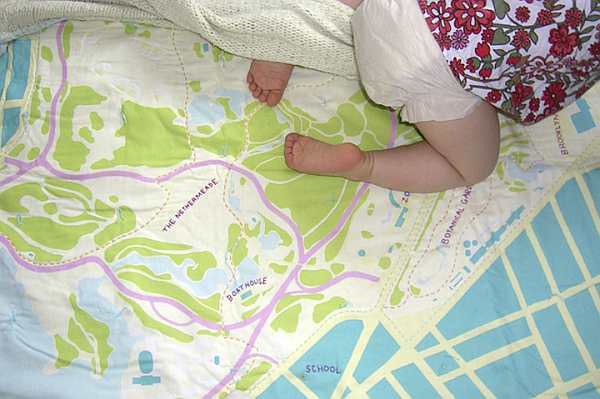 Prices start at US$95 for a baby soft-map, contact Haptic direct for shipping details. Emily has told us she is doing Australian maps and we will have images of these very soon to share with you. We actually discovered Haptic Maps back in June but were asked to hold this post because the New York Times wanted the exclusive on this one. I suppose if we are going to hold back on editorial for anyone, the NYT is not a bad publication to owe us a favour.